The New Moon formed today at 18degrees, 41 minutes Leo at 2:58 am PDT. This is a partial Solar Eclipse – the last of three eclipses in this final sequence of 2018. As you may know, eclipses occur at the same or nearly same degrees every 19 years. On August 11, 1999, there was a solar eclipse at 18 degrees, 18 minutes of Leo, very close to today’s eclipse degrees. Is there a resonance for you between those times and these? New Moons are an opportunity to set new intentions. This is a time of momentous change. If you need further assurance on this front, just look at today’s chart. Or watch some television news. Or check out the Weather Channel. Seven of 9 planets are retrograde. 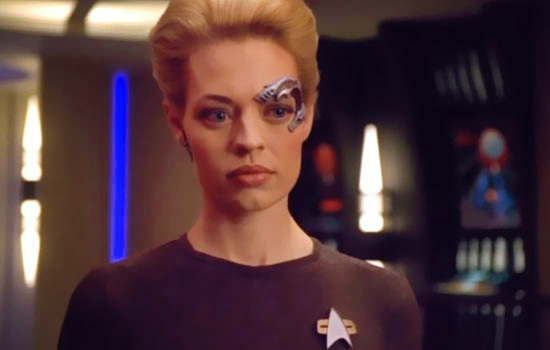 Now this might be coincidence but there’s a character on Star Trek Voyager named 7 of Nine. She’s a former Borg drone. Borg mind is very different indeed to the Human or Klingnon or Vulcan mind (as you will know if you’ve watched any Star Trek – ever). Yet she is a fully functioning and integral part of the Voyager crew. She is indispensable. That evolution took some time. And so will ours. Over the course of the Star Trek series, profound shifts have occurred. Yes, it’s the far future where we have all advanced significantly. But think about now and where we as a planet and we as humans are headed. We are beginning to understand that much as we do know – there’s a lot that we don’t know. There’s a lot of room for improvement and expansion, innovation, and renewal – none of which seems simple – but maybe it is. Perhaps, for the time being we cannot, or we refuse to see how to do that in this moment. That will not stop change from happening. It will only prevent us from understanding the changes. In order to expand and evolve we must break down the old order of things. I mean really allow for massive change. We have to make room for things, Beings and ways of being that we have not even contemplated at this point in human history. We will have to depart from the familiar suffering and pleasures of this current world in order to attain the next world. It won’t come easy and it won’t necessarily be one uninterrupted series of events that will culminate in enlightenment or perfection. But it will be different. Change will happen. Like it or not – it’s where we’re going. “Civilization” as we know it is collapsing. And that may actually be a good thing in the end. It’s not the first time. In fact it happens all the time to one extent or another. There will be great difficulties. And there will be great advances. Allegiance and Allies will change. New alliances will be formed. Social norms will shift and transform dramatically. Seven of 9 will become the norm. No one will blink an eye. There’s room for everyone. And so it goes. We have a lot to learn in a relatively short time. We seem to like to wait as long as humanly possible before changing course. That said, do not be impatient. Be present. Be open. Be aware. Be love. Today’s eclipse conjuncts Mercury who is retrograde in Leo. Mercury has no agenda. He just delivers the message and moves on. Listen to the message. And don’t shoot the messenger. If there was ever a time to set your New Moon intentions… Today is that day!